Mayer Malbin is the one-stop-shop for mechanical and plumbing contractors in the New York metropolitan area. 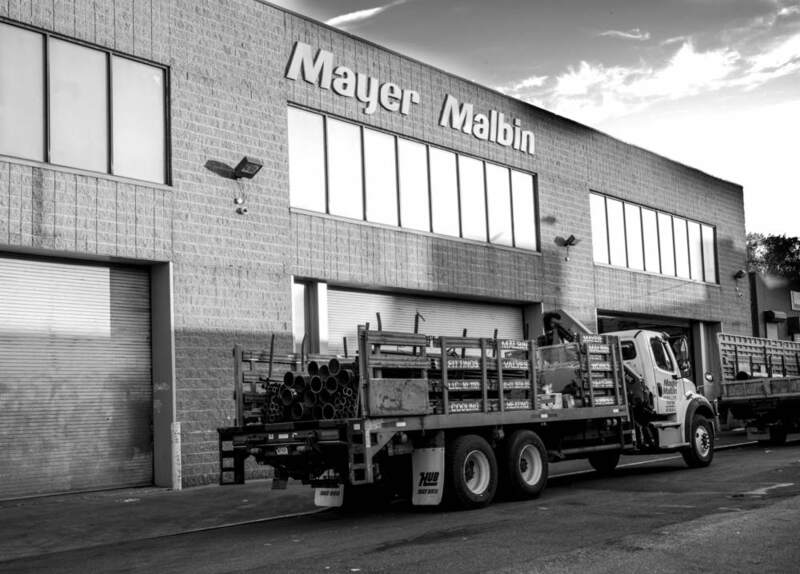 Mayer Malbin is a 120 year-old 4th generation family-owned supplier of pipe, valves, & fittings to the mechanical, plumbing, heating, sprinkler & waterworks trades in the New York metropolitan area. When you buy from Mayer Malbin, you can expect three things: (1) inventory, (2) experience, and (3) service. With a vast inventory of copper, carbon steel, cast iron, stainless steel, galvanized, PVC, CPVC, brass, chrome, and ductile iron pipe & fittings; a full line of ball, check, globe, gate, plug, and high performance and rubber seated butterfly valves; tools, hardware & hangers; and hundreds of specialty lines specific to the mechanical, plumbing, heating, sprinkler & waterworks trades, you can rely on Mayer Malbin as your one-stop-shop for everything needed to get the job done. Our entire inventory is conveniently located in our 110,000sqft covered warehouse in Long Island City, so you will never have to wait for a backorder, drive to another store location, or wait for a transfer from a distribution center before you get what you need. As a 120 year-old 4th generation family-owned business, the owners and employees of Mayer Malbin have dedicated their lives to knowing the mechanical, plumbing, heating, sprinkler & waterworks trades in New York. The owners of Mayer Malbin are the inside salesmen, so when you call with an order, you will be talking to someone with decades of experience who will know how to get you exactly what you need. Our outside salesmen have been working in the industry for just as long, and their unique backgrounds, experiences & expertise will ensure that you get the best service possible. Above all else, Mayer Malbin is dedicated to customer service. We have an experienced, dedicated, and knowledgeable sales team that will work closely with you to get you exactly what you need, when you need it. If you need something right away, you can pick up your order the same day you placed it at our convenient location in Long Island City. With our fleet of trucks, we can also make same or next-day deliveries to your shop or job site. Mayer Malbin, the founder of Mayer Malbin Company, Inc.
Mayer Malbin Company, Inc. was founded in the early 1890’s by Mayer Malbin after he immigrated to the United States from Austria-Hungary in 1891. It was a plumbing supply company located at 922 Third Avenue in New York City, New York, where, for a brief time, it was known as Malbin & Kammerman. From its founding until 1925, Mayer Malbin moved around the Upper East Side and even briefly opened a branch on Broome Street in Manhattan’s Lower East Side. Then in 1925, Mayer Malbin opened its first location in Long Island City, Queens -- the borough that was to become the business’ permanent home. In 1932, Mayer Malbin was incorporated in the State of New York and opened a location at 41st Street and 36th Avenue in Long Island City, where it remains today. At the beginning, Mayer Malbin was a plumbing supply house, selling toilets, bathtubs, and the like. Then in the 1950’s it dropped all of its fixtures and shifted focus towards selling the industrials in the area, which at the time were Grumman, Pepsi, National Sugar, Schaefer Brewing Co., Bulova, Squibb, and others. Two decades later it was time to shift gears again as all the industrials moved away. The focus shifted towards selling mechanical contractors, which remains the company’s primary focus today. In 2007, Mayer Malbin partnered with Wedco Fabrications, Inc., a precision welding, pipe fabrication, and cement lining company in College Point, Queens, New York. Wedco has been vital to Mayer Malbin’s continued success, allowing it to service all of the pipe fabrication needs of new and existing customers. In 2014, Mayer Malbin made another big addition to its lines of offering, establishing a division for selling waterworks contractors. Joseph Selden, a long-time employee of Mayer Malbin, purchased the company in 1950 a year after Mayer Malbin’s death. Since then, three generations of Seldens and Gordons have followed. First into the family business after Joseph was Bob Gordon, Joseph’s son-in-law. Then came Irwin Selden, Joseph's son. The third generation followed with two of Bob’s sons, Dan and Jon Gordon, and with Irwin’s son and son-in-law, Marc Selden and Edmond Jalbert. Recently, members of the 4th generation, Sam and Jason Gordon, entered the business, giving Mayer Malbin three active generations of Gordons.